Experience Points: Playing the "Powerless"
My latest PopMatters article is now live: Playing the "Powerless"
This piece was inspired by two exploratory articles by Mark Sample over at Play the Past. The first post raised the issue and brought up some interesting examples. The second post refined his sincere questions and asked readers to contribute. Naturally, since I find the topic fascinating, I did. I do encourage you to his Sample's posts and follow up later when wraps up the series with his own thoughts on the topic. In his upcoming posts, Sample promises to discuss the Mission US: Flight to Freedom. Like Sample, I also suggest you give this game a try if for no other reason than to check out some of the ideas coming out of the "serious" or educational games sector. Flight to Freedom is actually the second entry into the Mission US series the first of which follows a young boy shortly before the revolutionary war. Both games are relatively short and actually tell a far more interesting and evocative story than most of us have come to expect from educational games. 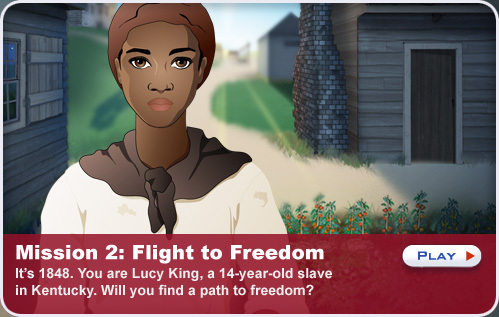 In Flight to Freedom, Lucy's story of escaping to from a slave plantation in the South is genuinely exciting at times, particularly when you have to make tough decisions without knowing the range of outcomes. Sure, we know slavery would meet its end eventually, but Lucy's fate is not so clear. Bumping into a stranger in an alleyway, for example, could result in her deportation back to slavery. At one point, the fate of a friend depends upon collecting enough evidence to help him during a trial. You only have a few actions. Do you try to find documents? Collect testimony from locals? If so, who do you trust? Some of the solutions are clearly telegraphed, particularly as players full aware of the realities at the time. Even so, when information is withheld and player decisions limited relative to the amount of options, you can actually feel quite powerless precisely because you know your decisions will change the story. In Crown or Colony?, you can see a concerted effort by the designers to approach the subject tactfully, even objectively, despite the sensitive material and our collective knowledge about how the revolution "went down." For example, after a riot results in numerous dead civilians at the hands of British troops, players can hear out multiple sides to the events that took place and, armed with that knowledge, voice their opinion on the matter, even if it is a bold-faced lie. In both games, the accrual of knowledge is a gameplay benefit and, quite intentionally, an educational benefit. These games, while not perfect, put in a great deal of effort in transforming a historical period into a consumable system of information, in which success is redefined as the extent to which players can grasp the political and social systems of complex power systems.